« Spotted on a wall. Fill in the last part. Maybe it’s my background in radio journalism, or the fact that I have what educators call an ‘auditory learning style’ (or maybe these are the same thing?) but sometimes I find the pictures on TV distracting, or obscuring of the heart of a matter. Yes I know, of course, there are times when the body language of an interviewee — their unspoken but very real communication — tells the story. 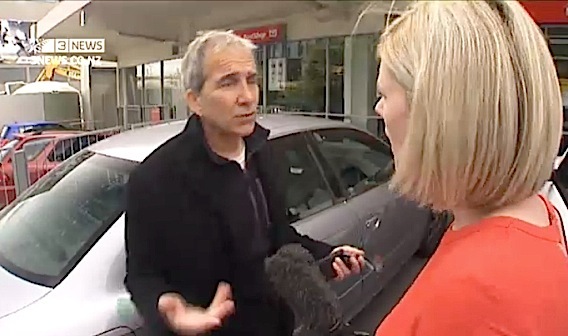 I watched Campbell LIVE’s intrepid Rebecca Wright doorstep Auckland mayoral candidate John Palino (video here if you haven’t seen it) and, sure, it was awkward. With allegations of sleaze circling the failed Palino-for-Mayor campaign; the campaign’s links to Len Brown’s sworn enemies; the [apparently] extraordinary involvement of his campaign worker Luigi Wewege (beyond the call of duty); and Mr Palino’s own 90-minute late-night meeting in a Mission Bay carpark(!) with the woman at the centre of it all (another Palino campaign volunteer, it seems) just before the story ‘broke’ on the Vendettas-R-Us hate-blog … well, sorry, the ‘dirty politics, sleazy right-wing plot’ angle probably isn’t going away any time soon. See also: Orchestrating smear campaigns against your rivals is seen as dodgy in business, so what about politics? That “doorstep” style of journalism – or interviewing – just doesn’t do it for me. I end up feeling empathy for the person being “doorstepped” which is exactly what i did last night. This isn’t the first time i have seen Rebecca do this. She talks so fast and over the top of the person that she is “interviewing” which just leaves me wondering what the heck i just watched, and the only thought in my head at the end is that i wonder what she is like when she argues with her partner. She would be most men’s worst nightmare. I guess i will continue to watch her – because it makes me laugh when she goes off like a banshee – but in my view she did Palino a favour last night. Put us all out of our misery and tell us what you think … you’ll only come up with some amazing set of observations anyway so why the suspense and lip service to democracy and free speech. I think he was lying at times and extremely guilt ridden at others. He’s been caught with his pants down … just like Len Brown – who incidentally needs to resign i think. Dont think much of rebecca wright as an interviewer … cute dress though which is alarming given that i know members of her family well. Here’s the thing: there’s a lot of (too much) cosy collusion in the co-dependent/hot-tub relationship enjoyed by the media and the political elite. If Mr Palino had been able to say, ‘Read my [carefully-worded, dodge-the-hard-questions] statement’ and have that be the end of the matter despite the draught from the gaping holes in his explanation … well, that’s just dumb, innit? Yeah. I that is fairly dumb. But this is a free country and if he doesn’t want to talk to the media – he doesn’t have to. In my view a really good journalist would be able to secure a proper interview – rather than that crazy doorstepping/chasing someone around a parking lot stuff. I was rather annoyed that she had me empathising with Palino. I personally liked John Palino when I met him, although I didn’t buy his ‘second city at Manukau’ vision … it kinda felt like it was a just a push against the higher density vision … but what do I know? I’m not an urban planner’s elbow. And being from New Jersey, maybe he learned something from the NYC/Jersey Shore relationship. He got 100,000 votes. That’s an achievement not to be sneezed at. Of course a private citizen (such as yourself, Jackie) should be free to avoid the media gaze/scrutiny/spotlight, but sorry, if you’re running for mayor … and there’s the sharp pong of something fishy and it rhymes with roo-eee-gee-tee-gee-gee who was on your campaign team, and his dealings with the son of your campaign manager, … and you met in a carpark for 90 minutes … well … yeah, I have some questions for you the public might appreciate hearing the answers to. At least some in the public. Mr Palino’s ‘media strategy’ was: drop a written statement and go to ground. That approach made Rebecca Wright’s door-step interview a legitimate option — as ‘crazy’ as it may have looked. Yeah i can see your point, but the difference between how Campbell Live treated Len Brown during his interview and how they have treated John Palino can not go unmentioned. That difference does not make for balanced journalism. What do you make of the theory that a determinant was their contrasting approaches to the media in the glare of this controversy? Mr Brown ‘fronted up’ and presented himself for an interview on the day the crisis emerged. … whereas Mr Palino has (apparently) declined all such invitations/requests for such an interview, preferring, as I mentioned, a PR strategy of “Read my statement” and making himself unavailable? I make of that – that just because someone declines to be interviewed doesn’t give you the right to bully them and force them to be interviewed. The media has no right to force public figures to behave the way they want them to or make the choices they would make. Do they? Does Rebecca Wright really have that authority? So now everyone is to believe that if they agree to be interviewed by Campbell Live when asked – they might get treated fairly but hell hath no fury like Rebecca Wright when she has been declined? That just doesn’t seem moral or right to me. By his refusals and avoidance of ANY media interviews (not just Campbell LIVE) Mr Palino was, it seems to me, clearly — as a ‘strategy’ — dodging his accountability for the (let’s face it) highly dubious actions of his campaign worker Mr Luigi Wewege and avoiding answering questions about his (Mr Palino’s) campaign actions in the lead-up controversy. Dropping a statement and ducking for cover was never going to cut it. I would have thought Mr Slater senior would have given him advice to that effect. Hopeless. So do we get to see the naked photos, or what? And here i was hanging around waiting for it … and you go and become a wet blanket. If you can post exnzpats steamy excerpts you can at least let us have the racy parts of the story.